There isn’t much in the way of details at the moment but looking at the poster already fuels excitement. Chike Lindsay Ajudua was last seen dealing a loss to Malaipet Saisprapa in a fight where he picked up the WBC International championship. Chike looks like he is intent on making the next few months very busy ones as he is scheduled to fight Cyrus Washington at The New York based promotion: Take-On. Should Chike win this fight he will be bound for the January 26th, 2013 Yokkao Extreme event. 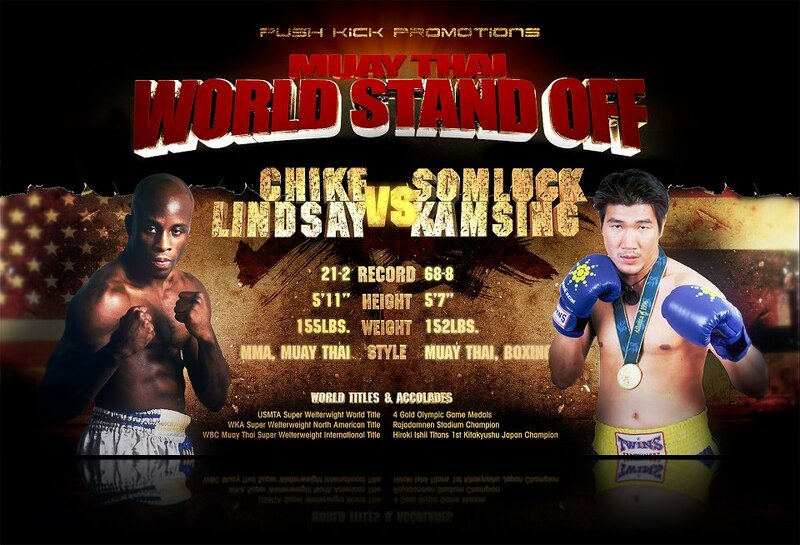 It seemed like the heat of that possibility hadn’t even cooled off when California promotion Push Kick Promotions announced the match up of Chike Lindsay Andjua Vs. none other than Thai star Somrak Kamsing. Somrak is set to fight versus Jomhod Kiatdisak at the Lumpinee Birthday Celebration fights. If any USA promotional entity could pull it off I do believe actually that push kick could and want to do it. This is after all the same promotion that brought Lerdsila “Mr Lightning” Chumpairtour and Rung Reung Chai as well as Ekpracha “The Hitman” Meenayotin and Chonglag “No Wait” Keawit. This is a Promotion with ambition if not sometimes the best organizational cohesion behind their events. I want to support them more but some things are off such as the WMC branded Pomona Fairplex. It’s unnecessary and distracting in my opinion. The fighters are the stars and always should be of the event. One thing Push Kick promotions has never been short on is star power among fighters. And if they make this fight come together the stars can in fact make Push kick Promotions grow. To quote The film Field of Dreams, if you build it they will come. Beyond, the attention-getting promotional artwork there is little more to go on in terms of details or any other part of the card. One thing is certain: they’re seeking new blood. If you’re a fighter check it out here: http://pushkickpromotions.com/fighters-wanted/. But this more than adequately serves to keep appetites whetted if the event does appear in March 2013. Push Kick Promotions’ team promises more details will come soon and I cannot wait. To whet your appetite even more here is a clip of Chike preparing for his Yokkao qualifier below. ~ by fatsoking on November 2, 2012.